In-App Purchase (IAP) allows providers of ongoing services through Odoo apps to be compensated for ongoing service use rather than — and possibly instead of — a sole initial purchase. Users purchase service tokens from Odoo. 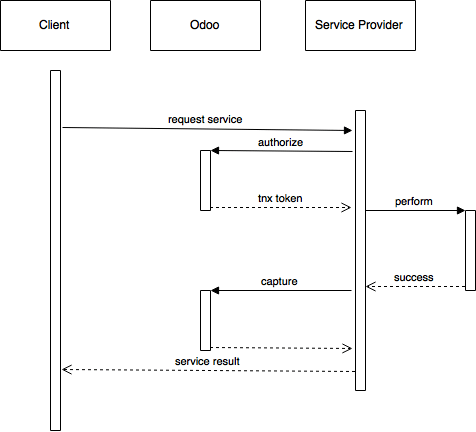 Service providers draw tokens from the user’s Odoo account when service is requested. This document is intended for service providers and presents the latter, which can be done either via direct JSON-RPC2 or if you are using Odoo using the convenience helpers it provides. The Service Provider is (probably) you the reader, you will be providing value to the client in the form of a service paid per-use. The Client installed your Odoo App, and from there will request services. Odoo brokers crediting, the Client adds credit to their account, and you can draw credits from there to provide services. 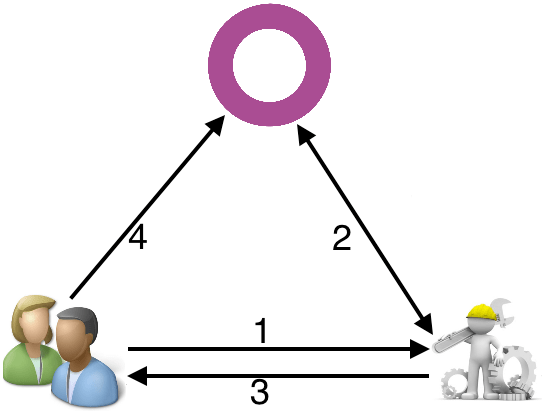 The External Service is an optional player: you can either provide a service directly, or you can delegate the actual service acting as a bridge/translator between an Odoo system and the actual service. The credits went from integer to float value starting October 2018. Integer values are still supported. for a postage service: 1 credit = 1 post stamp. A credit can also simply be associated with a fixed amount of money to palliate the variations of price (e.g. the prices of sms and stamps may vary following the countries). The value of the credits is fixed with the help of prepaid credit packs that the clients can buy on https://iap.odoo.com (see Packs). In the following explanations we will ignore the External Service, they are just a detail of the service you provide. The Client requests a service of some sort. The Service Provider asks Odoo if there are enough credits for the service in the Client’s account, and creates a transaction over that amount. The Service Provider provides the service (either on their own or calling to External Services). The Service Provider goes back to Odoo to capture (if the service could be provided) or cancel (if the service could not be provided) the transaction created at step 2. Finally, the Service Provider notifies the Client that the service has been rendered, possibly (depending on the service) displaying or storing its results in the client’s system. The Client requests a service as previously. The Service Provider asks Odoo if there are enough credits on the Client’s account and gets a negative reply. This is signaled back to the Client. Who is redirected to their Odoo account to credit it and re-try. act as intermediary to an other service provider (e.g. bridge to an MMS gateway). The first step is to register your service on the IAP endpoint (production and/or test) before you can actually query user accounts. To create a service, go to your Portal Account on the IAP endpoint (https://iap.odoo.com for production, https://iap-sandbox.odoo.com for testing, the endpoints are independent and not synchronized). Alternatively, you can go to your portal on Odoo (https://iap.odoo.com/my/home) and select In-App Services. On production, there is a manual validation step before the service can be used to manage real transactions. This step is automatically passed when on sandbox to ease the tests. Log in then go to My Account ‣ Your In-App Services, click Create and provide the informations of your service. name - ServiceName: This is the string you will need to provide inside the client’s app when requesting a transaction from Odoo. (e.g. self.env['iap.account].get(name)). As good practice, this should match the technical name of your app. label - Label: The name displayed on the shopping portal for the client. Both the ServiceName and Label are unique. As good practice, the ServiceName should usually match the name of your Odoo Client App. icon - Icon: A generic icon that will serve as default for your packs. 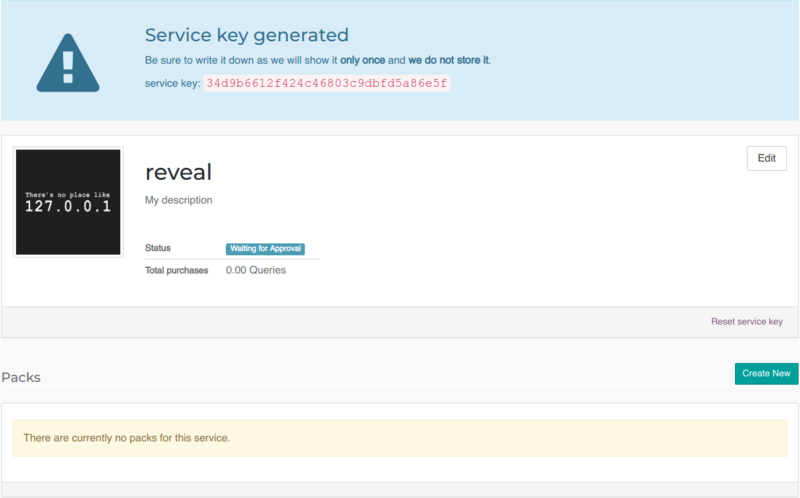 key - ServiceKey: The developer key that identifies you in IAP (see your service) and allows to draw credits from the client’s account. It will be shown only once upon creation of the service and can be regenerated at will. Your ServiceKey is a secret, leaking your service key allows other application developers to draw credits bought for your service(s). trial credits - Float: This corresponds to the credits you are ready to offer upon first use to your app users. Note that such service will only be available to clients that have an active enterprise contract. You can then create credit packs which clients can purchase in order to use your service. Price: price in EUR (for the time being, USD support is planned). 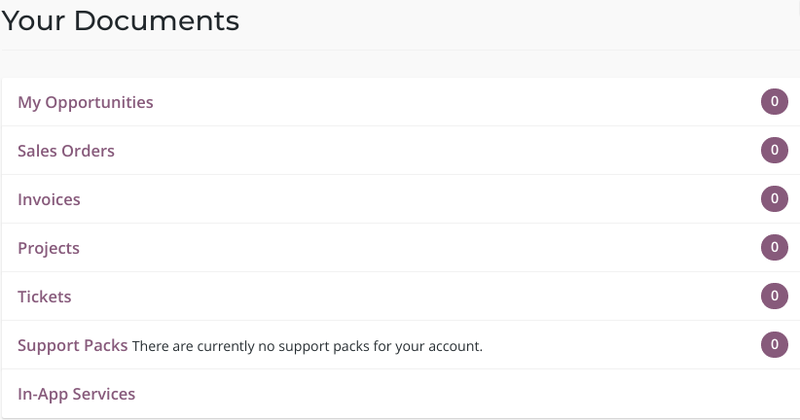 Odoo takes a 25% commission on all pack sales. Adjust your selling price accordingly. Depending on the strategy, the price per credit may vary from one pack to another. The second step is to develop an Odoo App which clients can install in their Odoo instance and through which they can request the services you provide. Our app will just add a button to the Partners form which lets a user request burning some CPU time on the server. First, we will create an odoo module depending on iap. IAP is a standard V11 module and the dependency ensures a local account is properly set up and we will have access to some necessary views and useful helpers. Second, the “local” side of the integration. Here we will only be adding an action button to the partners view, but you can of course provide significant local value via your application and additional parts via a remote service. We can now implement the action method/callback. This will call our own server. There are no requirements when it comes to the server or the communication protocol between the app and our server, but iap provides a jsonrpc() helper to call a JSON-RPC2 endpoint on an other Odoo instance and transparently re-raise relevant Odoo exceptions (InsufficientCreditError, odoo.exceptions.AccessError and odoo.exceptions.UserError). the token of the current client that is provided by the iap.account model’s account_token field. You can retrieve the account for your service by calling env['iap.account'].get(service_name) where service_name is the name of the service registered on IAP endpoint. iap automatically handles InsufficientCreditError coming from the action and prompts the user to add credits to their account. jsonrpc() takes care of re-raising InsufficientCreditError for you. If you are not using jsonrpc() you must be careful to re-raise InsufficientCreditError in your handler otherwise the user will not be prompted to credit their account, and the next call will fail the same way. By default, charge contacts the production IAP endpoint, https://iap.odoo.com. While developing and testing your service you may want to point it towards the development IAP endpoint https://iap-sandbox.odoo.com. To do so, set the iap.endpoint config parameter in your service Odoo: in debug/developer mode, Setting ‣ Technical ‣ Parameters ‣ System Parameters, just define an entry for the key iap.endpoint if none already exists). The charge helper has two additional optional parameters we can use to make things clearer to the end-user. is a message which will be associated with the transaction and will be displayed in the user’s dashboard, it is useful to remind the user why the charge exists. is the name of a QWeb template which will be rendered and shown to the user if their account has less credit available than the service provider is requesting, its purpose is to tell your users why they should be interested in your IAP offers. The IAP transaction API does not require using Odoo when implementing your server gateway, calls are standard JSON-RPC2. Calls use different endpoints but the same method on all endpoints (call). Exceptions are returned as JSON-RPC2 errors, the formal exception name is available on data.name for programmatic manipulation. Verifies that the user’s account has at least as credit available and creates a hold (pending transaction) on that amount. Any amount currently on hold by a pending transaction is considered unavailable to further authorize calls. Returns a TransactionToken identifying the pending transaction which can be used to capture (confirm) or cancel said transaction. Confirms the specified transaction, transferring the reserved credits from the user’s account to the service provider’s. 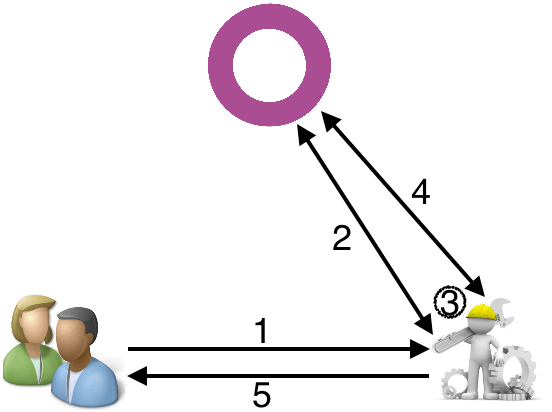 Capture calls are idempotent: performing capture calls on an already captured transaction has no further effect. Cancels the specified transaction, releasing the hold on the user’s credits. Cancel calls are idempotent: performing capture calls on an already cancelled transaction has no further effect. Exceptions aside, these are abstract types used for clarity, you should not care how they are implemented. 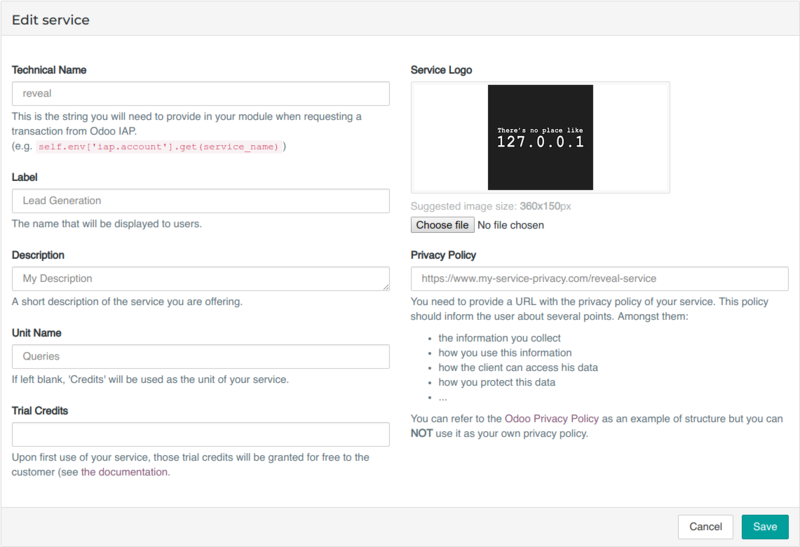 String identifying your service on https://iap.odoo.com (production) as well as the account related to your service in the client’s database. Identifier generated for the provider’s service. Each key (and service) matches a token of a fixed value, as generated by the service provide. Multiple types of tokens correspond to multiple services. As an exampe, SMS and MMS could either be the same service (with an MMS being ‘worth’ multiple SMS) or could be separate services at separate price points. Your service key is a secret, leaking your service key allows other application developers to draw credits bought for your service(s). Identifier for a user account. Transaction identifier, returned by the authorization process and consumed by either capturing or cancelling the transaction. Raised during transaction authorization if the credits requested are not currently available on the account (either not enough credits or too many pending transactions/existing holds). any failure in an inter-server call. (typically, in jsonrpc()). Raised by any unexpeted behaviour at the discretion of the App developer (you). Test the whole flow from the client’s point of view - Actual services and transactions that can be consulted. (again this requires to change the endpoint, see the danger note in Service). The latter consists in specific tokens that will work on IAP-Sandbox only. Token 000000: Represents a non-existing account. Returns an InsufficientCreditError on authorize attempt. Token 000111: Represents an account without sufficient credits to perform any service. Returns an InsufficientCreditError on authorize attempt. Token 111111: Represents an account with enough credits to perform any service. An authorize attempt will return a dummy transacion token that is processed by the capture and cancel routes. Those tokens are only active on the IAP-Sanbox server. The service key is completely ignored with this flow, If you want to run a robust test of your service, you should ignore these tokens. For convenience, if you are implementing your service using Odoo the iap module provides a few helpers to make IAP flow even simpler. A context manager for authorizing and automatically capturing or cancelling transactions for use in the backend/proxy. description = "We will demonstrate the power of this station on your home planet of Alderaan." # a maximum of 2 credits will be charged/captured. # We shall rule over the galaxy! Will cancel an authorized transaction. Will capture the amount credit on the given transaction.